For any geologists reading this blog, I am not speaking about tectonics from the geology standpoint. I am not going to discuss whether the continents derived from the supercontinent Pangaea, or how plates thrust together to form mountains. For my purposes here, tectonics refers to the widespread impact of something and speaks to the pervasive influence of some factor or affect. Sustainability tectonics (my term) are those inescapable factors that influence an operation or landscape and its ability to achieve sustainability. Note: I am not attempting to define sustainability here. Suffice that we all have a generally similar idea of what it is. If you want more clarification, please peruse some previous TWG blogs. Sustainability tectonics (my term) are those inescapable factors that influence an operation or landscape and its ability to achieve sustainability. I suggest that the main geologic factor influencing sustainability is bedrock. Any grounds professional will attest to the importance of soil towards supporting a healthy and functional landscape. But what makes soil? The bedrock of an area creates the soil we work in. Here in Springfield, MO, our bedrock is Burlington limestone. As a result, our default pH is alkaline. If I want to create a landscape that prefers an acidic environment, I must undertake significant interventions. And those interventions will necessarily be temporary, requiring repeated amendments to be sustainable. 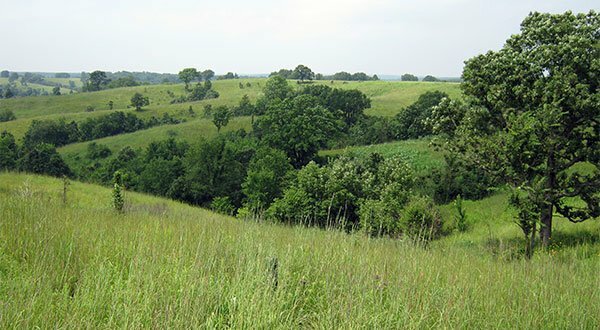 It is much easier to take cues from the indigenous flora and plant a landscape that can tolerate higher pH, or plant adapted plants if a nonnative palette is suitable. 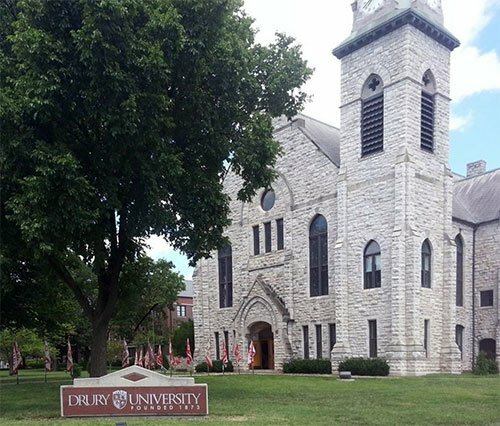 The limestone for this church on Drury Campus was cut from local bedrock. Springfield, MO. can be a volatile climate. In this respect, we are no different from most places. Our historic extremes are -29F and 113F. However, our average temperatures range from 22F to 90F. Based on these numbers our normal weather is stable, but we can get fluctuations. I tell people that the droughty periods we experience (2012, 2018) and the heat (May 2018 hottest on record) is unusual, but not unheard of. Fortunately, our plants, animals and insects are wonderfully adapted to the Missouri climate. Growing the plants that are adapted to a region doesn’t mean plant it and forget it. Planting with an eye to sustainability means that the plants we grow will require less intervention (resources) based on the prevailing climate of our site. It doesn’t mean that everything will always grow. Nor should we seek to overcome too many impediments to accommodate a landscape. The water cycle is yet another monolithic influence on sustainability. Water is one of the essential requirements for plant growth. It is also essential for human life. The aspects of water that are the most challenging to cope with is regularity and scarcity. Regularity means can we obtain water when we need it. Scarcity is asking is there enough water supply to meet all our demands for it. We could start discussing water priority (drinking versus irrigation) but I digress. The main obstacle facing a sustainable water situation is living, or should I say growing, within the natural water budget. Every time an operation uses water that does not fall from the sky or generated on site (springs, catchments, etc.) the goal of sustainability recedes. The sustainable landscape should not receive non-natural water. Planting with an eye to sustainability means that the plants we grow will require less intervention (resources) based on the prevailing climate of our site. In nature, every niche is exploited, and change is constant. No matter what condition a landscape is in at a given moment, that landscape is transitioning (growing) something else. Turf must be mowed to maintain it within a narrow tolerance because if eft unmaintained tall fescue will grow to 12 or so inches and then go to seed. Planting beds must be pruned, mulched, weeded and replanted otherwise they become unruly, escape boundaries or change their planting mix. Maintenance all takes place to prevent the landscape from growing into something that is deemed unacceptable. In Springfield, over the course of history, our landscapes were an Oak/Hickory forest dappled by savannah. This matrix of plants and animals is what our ecosystem strives for. If left alone, succession will drive towards this destination despite the disturbed aspect of the urban setting. Sustainability in the landscape is about aligning what the landscape is, with our maintenance regimes. To the extent that these two objectives differ, is the extent to which we have to invest resources to overcome macro-influences. On a golf course or sports field, the distinct purpose of the field is largely unnatural. Thus, it will be harder to align sustainable operations with the objective of the landscape (many golf courses/sports fields, etc. are successfully pursuing sustainable operations despite the inherent challenge of doing so). On a college campus however, the landscape has more variability in what is expected of it. 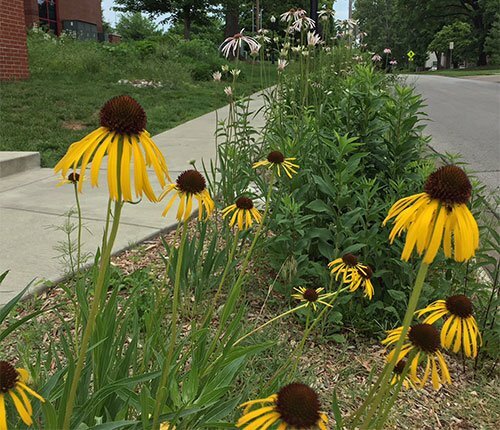 In this setting the sustainable management of the landscape can be furthered by designing, installing, and maintaining a more natural landscape. The key will be a landscape that pays homage to sustainability tectonics, not persists in opposition to it. Naturalizing plantings unify function and sustainability, but are not suitable to all locations.